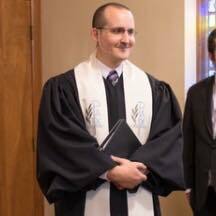 I'm ordained in the United Church of Christ and have been a local church pastor for over 14 years in several places around northeast Ohio. I am also trained as a spiritual director in the tradition of Ignatius of Loyola. I have a special interest in writing, speaking, and teaching about Christian spirituality in ways that educate, challenge assumptions and established norms, and help people connect their sense of the transcendent to everyday life. My latest books, Wonder and Whiskey: Insights on Faith from the Music of Dave Matthews Band, and Prayer in Motion: Connecting with God in Fidgety Times, both released in the summer of 2018. My writing has also appeared at the Shalem Institute blog, The Englewood Review of Books, the Christian Century blog, and The High Calling, among other online places. I have led workshops and retreats on spiritual practice, ministry, and clergy vitality. I'd be glad to connect with you for an event that you're planning. Find out more about that here. Things I like include being with my family, music, Michigan sports, karate, collecting Magic cards, playing with LEGOs, a good coffee or bourbon, and everything about the fall season. Sign up for my author newsletter. I'm also on Facebook and Twitter.